Kuando Busylights provide a visual indicator of your presence status through integration with Skype, Lync, Cisco Jabber and more. As a status light, the Busylight will automatically change its colors according to your status in Skype/Lync, signaling to colleagues if you are busy. It is also a reliable ringer for softphones, making it easy to hear and see incoming calls. Today’s workers want to be in a modern, open environment where they can collaborate but also focus to complete work timely – without prolonging their work day. The issue in these environments are unnecessary interruptions which frustrates employees and makes their work life more challenging. This can have an impact on the company’s overall productivity and is creating a huge challenge for Facility and HR/Workplace departments. Deploying the Kuando Busylight, a real-time status indicator will help to regulate the communication flow between people and avoid interruptions. This creates an office environment where staff don’t get disrupted and are ultimately able to work more efficiently. 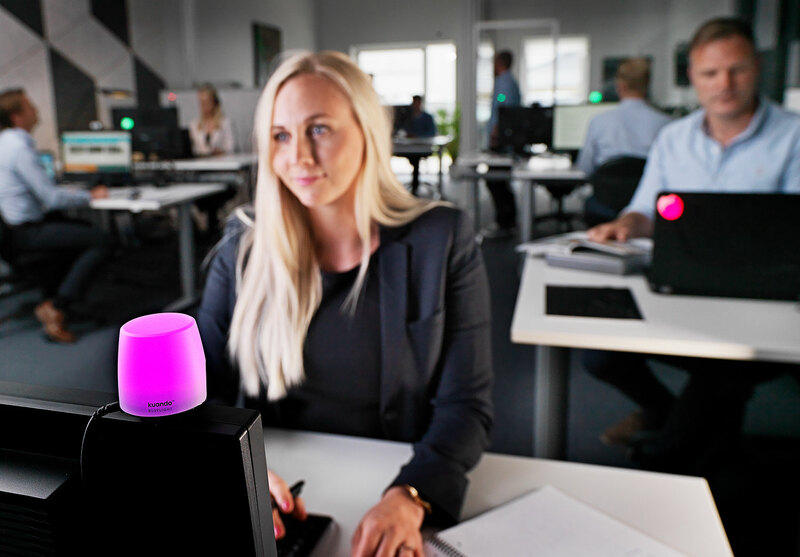 The Busylight is a proven solution in the open office or any workplace that gives employees the ability to Visually know When the time is right to approach others. The Busylight is a brilliant & simple concept that sets new standards for working better. Connects as an USB device – not an audio device. 100% reliable – also when PCs have disabled soundcards/speakers. No more support tickets to fix individual audio settings. An immediate visible cue of your team’s current status. Avoid the risk of losing opportunities for your organization by creating an agile environment with Kuando Busylight Omega. Then employees can react on missed calls or IMs quickly. The Busylight lower the average answering time in your organization and speeds up communication. With outlook calendar integration, the Busylight Alpha can even be a visual reminder of meetings etc. Browse the SENSUS Online Store today to purchase your very own Plenom Busylight and accessories. *Varies per model/wearing style. Depending on usage.